First up is a game I found in an ironic way. 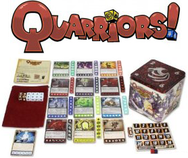 It's called Quarriors, like Warriors with a "Qu", and it's uniqueness is extremely intriguing and fun! Before I give you my spin, here's a great video to bring you up to speed on it! My take? I've played about 20 games of this so far, and it's amazingly simple, fun, and full of strategy! First thing you notice is the design. The cards are beautifully drawn and have a unique flair to the artwork. It's not Anime and it's not overly cartoony, it really does fit itself though. The second thing you realize, is that it's extremely simple. I felt at many times like I was playing Dominion with dice... and yet, it flt new and exciting. 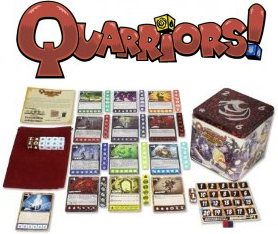 While similar to Dominion in setup with a certain number of optional cards (or in this case dice) to acquire, the randomness of the dice and the combos seem well balanced and still enticingly strategic to pull you in. I found myself, while only looking at 3 different versions of each character (regular, strong and mighty) trying to pick apart, ok, if I rolled this, and this, and did this, what would happen? It got me thinking, which I love a game to make me do. Games take about 20 to 30 minutes as a 2 player, with it taking slightly longer (maybe 15 minutes per player added) for 3 and 4 player games. Set up is easy and takes moments. The length comes in using your dice rolls! Do you summon an army and go for glory points and attack (glory points are how you win) or do you build and acquire more, so later turns are more powerful? Or, do you balance your moves, scoring and building where you can? Throwing dice is just always an entertaining activity to me, due to the randomness and the continued draw of "nailing it" and getting exactly what you wanted. Rolling the best results is like top decking in a card game and it really comes to life in this game when you roll the highest level of a character and get them in play to wreak some havoc! My only drawback is I wish there were more characters to play with! The game does an excellent job of bringing the characters to life in art and game play, but after you've seen the Defender of the Pale in all 5 games you play in a night (even with the randomness of cards drawn for set up) you pine for more characters... which of course, means more dice, and hopefully leads us to expansions! Oh, and you might ask what was the odd way I found this title? I use an app called Zite on my iPad and one of my categories is "Board Games", and it showed a review of this one day, which lead me to the video shared, and then I was hooked. 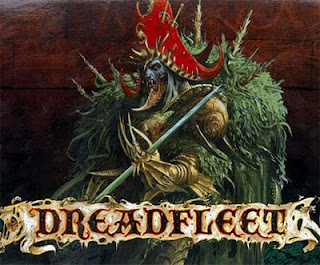 Second up is a new Games Workshop item I found... Dreadfleet! This is the one I have not played, but want to. Let's face it, aside from price, we've all played a Games Workshop product at some point, and been amazed. Their products are top notch, their game play enveloping, and intriguing and brimming with so much strategy and tactical combat that even Napoleon couldn't shake a stick at it. Henceforth, I can't say I'm disappointed in what I see in front of me at all when I see Dreadfleet. The opportunity launch a steampunked Dwarven pirate ships attacks at a dead man's chestful of an armada!? Count me in! While I know we all miss that gorgeous ex-girlfriend of ours, WOW Minis... I thought I'd share these insights with you for discussion, your enjoyment, and your discussion. I hope everyone is doing well and that as I find more gems like these, I can pass them on. In the meantime, if you have any games you have found you think I should check out, let me know!